- Press Releases - Global Kiosk Systems Ltd. Virtual Studio is a computer program designed exclusively for Remco. 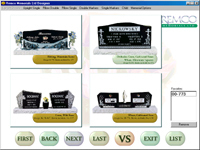 Together with your Remco Authorized Memorial Counselor, you will be taken on a virtual tour of Remcos entire inventory of monuments and markers to cover all your options. 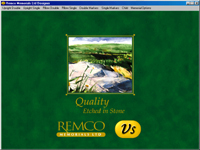 Before you decide on the final design, Remco will arrange the elements in several different ways on the computer screen. It's important that you end up with a monument that your family can cherish for generations to come. Since our last release of Virtual Studio version 3.0, Remco has come back to Global requesting new features to achieve peak efficiency. - A pricing module has been added so the client will know all the options within their price range, with accuracy and reassurance of the purchase price. - Included is a new powerful and productive contract module that mimics the paper version. - Finding pictures and accessories have been made simpler by the implementation of a keyword search. - Version 4.0 now allows users to customize the interface according to their own preferences, making it a snap for anyone to navigate throughout the application. - The application has been modified to use an internal database instead of BDE, preventing any interactions with other programs and lessening memory requirements. - The format of all images have been changed to reduce RAM requirements by over 75%, this equates to an increase of application speed. - A New and improved setup program now makes the install process of the application painless. The user is walked step by step through the set up process to achieve a truly custom application to their own preferences. - Global has developed a custom work around for the known Microsoft Windows printer drivers, virtually guaranteeing any printer can be used with the application.